3D Virtual Tour or 3D Showcase offers immersive and complete views of your property through inside view, dollhouse view and floor plan view. Take advantage of this innovative opportunity to let your customers actually move through your property, and get a full sense of the space. One of the best aspects of Matterport’s signature True3D™ technology is that each time you create a 3D virtual tour, our software automatically processes your scans into a proprietary Matterport™ dollhouse. This completely unique 3D dollhouse gives users an even clearer sense of space and size that’s simply unparalleled by 2D photos and videos alone. We create stunning 3D Dollhouse views for your customers. With this view, as the name suggests, they can look from outside to the scanned space, they can rotate and turn it as they like and switch to Inside View mode anywhere. Whether it’s a shop, a restaurant or the suite they have booked, customers are more engaged and have immediately the preview of the entire space and the feeling of actually being there. CoreVR turns your existing Matterport™ Spaces into immersive virtual reality experiences – automatically! 3D Spaces from Matterport™ are the most immersive and engaging way to experience real-world places straight from your web browser. Virtual reality takes this sense of immersion to the next level by blocking everything else and making users feel like they’re really there. Whether you’re doing it on a standard browser or using VR glasses, with VR, Matterport™ Spaces are even more immersive. Viewers get a full sense of place and can experience it cognitively without being physically there. Use Mattertags™ to engage the visitors into a virtual discovery tour. In this way, your space can be fully explored from the comfort of one’s home. Present the visitors with any relevant additional information throughout the virtual tour using texts, videos, additional images or even weblinks. For industrial spaces, use the Mattertags™ to link information, instructions or any other relevant information. With highlight reel, you can curate a gallery of the most interesting features of a space – called highlights. For example, point your audience toward that expansive view from the second-floor study, or emphasize key upgrades, all via the highlight reel. And to give your audience a full-service experience, organize highlights into a fully automated guided tour through your property. With guided tour, your viewers can press play, sit back, and have you guide them through the major features of a space. Guided tour gives you another way to help viewers fully experience a space. The floorplan is a 3D site plan that directly identifies the special features of the premises. You can view the whole object or each floor individually. Use this 3D storefront for an overall look, to discover Mattertags™ or to switch to Inside-View mode at a location of your choice. Based on the 3D Matterport™ scanning, the Space is also measured and we can deliver to you the Schematic Floor Plan in a zip file containing in PNG, SVG and PDF formats. The Schematic floor plan includes gross internal area measurements, the floor area measured to the internal face of the external walls. By the automatic laser measurement of your premises we are able to document entire real estate in a short time and to create a floor plan for you. An interesting tool to make missing drawings or to renew after reconstruction. 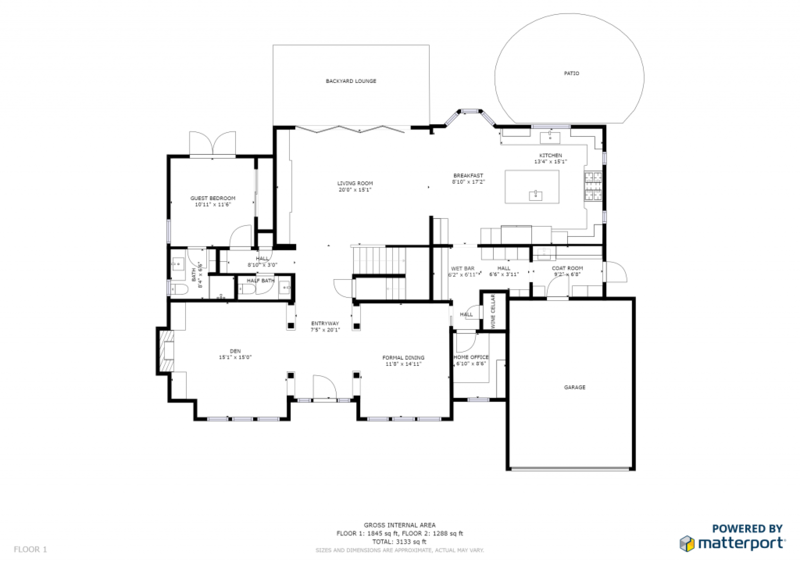 • High-resolution floor plan image (This is NOT the Schematic Floor Plans.) This is similar to the ceiling plan image but of the floor. 3D data is accurate to within 1% of reality. The MatterPak™ Bundle is for architects, engineers, and construction professionals who want to import these assets into third-party programs (3ds max, ReCap, Revit, or AutoCAD), perform additional work and then offer as part of a commercial package to their clients. Publishing to Google Street View (subject to Google’s Terms of Service) is a exciting new way for you to extend your marketing so you and your business can reach an even bigger audience. When your customers look for your business on Google, they will also see the 360º imagery that the photographer captured. Your space will be available on Google Maps, Google Earth and Google Street View app. Your customers can virtually visit your businessbefore visiting in person. Visitors who have already toured your business online are more comfortable when they see it in person, and thus are more likely purchase your goods or services. See an example on Google Maps. Take advantage of unique video content in your social streams. We offer latest high tech marketing options. incl. Matterport 3D Showcase, drone videos and high quality video content, to create materials to showcase your property or space.